The GeekVape LOOP RDA has been sat in a box on my shelf for about two months. This isn’t normal either; usually, I unbox stuff as soon as I get it… but this one just kinda fell through the cracks. This was a mistake because the GeekVape LOOP RDA is one of the best straight-up dripper RDAs around right now. The atomizer is near-perfect in my estimation, especially if you love dripping. OK… But Doesn’t The LOOP RDA Squonk? The MAC Daddy – And It’s ONLY 10 BUCKS Right Now! Yes, it will 100% squonk – and that’s great. But I actually prefer to use it as a dripper, when I’m working on my computer (like now). I have a TON of BF RDAs, so I haven’t really been dripping at all these past 12 months. I forgot about the magic of dripping, how it feels and vapes completely differently to squonking. And, yes, I realized I actually really missed it! I wanna be completely honest here. I have the Recoil Rebel RDA, which cost a lot, and the LOOP RDA wipes the floor with it – for flavor, for looks, for not leaking. To me, this is a big deal because the LOOP RDA is a lot cheaper than Recoil Rebel RDA. 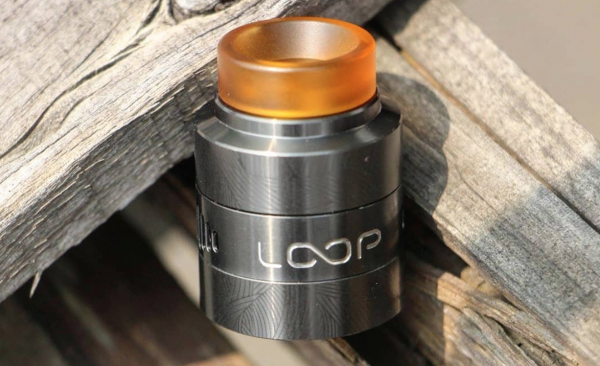 The RDA is BIG – The LOOP is Big; I’m talking 26mm from top to bottom. It’s wide too, and this ensures the air inside gets swooshed around for maximum flavor. The Airflow – You have three potential settings and, again, they’re BIG. This creates smooth, consistent airflow onto the coils which results in a cool, smooth vape. 5mm Juice Well – The juice well on this thing is MASSIVE. You can dump E Juice in it and it’ll vape for 20-30 puffs no problem. It also NEVER leaks, as the airflow slots are mid-way up the chassis. The Deck – Put simply, it’s awesome. Made with a “W” design, it can run dual or single coil builds. Install is simple, taking no more than a few minutes, and it vapes like a monster in either setting. 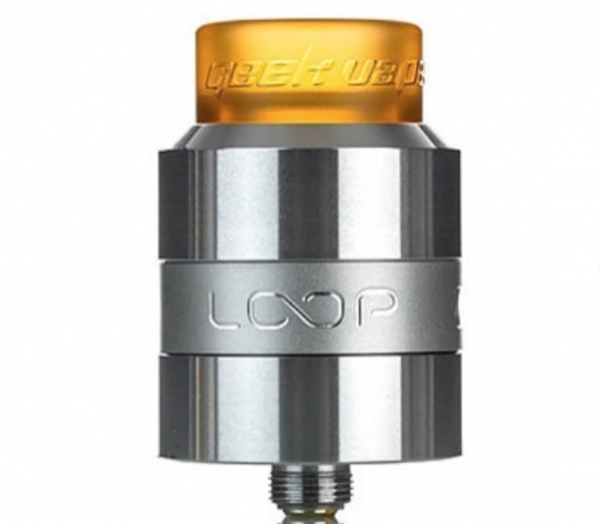 On top of this, I think the LOOP is one of the best-looking RDAs around right now. It’s big, robust, solid, and it feels exceedingly premium. It also squonks too, so if you don’t want to drip, you can simply swap out the 510 pin for the squonk pin and you’re away. From the top cap to the branding, everything looks pristine and perfectly implemented. I also really like that it can handle all kinds of builds from big installs to tight single coil ones. A+ on both counts, basically. This thing is a flavor machine. I unboxed it a couple of weeks back and I haven’t put it down since then. I love that you can just drip straight down the drip tip and not have to worry about it leaking out of the sides. For me, this is one of the main reasons why I use it solely as a dripper – it’s so rare to find a good RDA (for drippin’) that doesn’t leak out the sides when you get a little too overzealous. Chuck in a massive juice well (5ml), absolutely KILLER flavor and tremendously smooth, swooshy airflow and you’re in a very, very good place. So… how much for all this awesomeness you ask? I picked mine up via DirectVapor for $10!!!!!! – that is an INSANE price for an RDA this good! So, yeah… if you’re looking for a good-looking, solid dripper to add to your collection, the GeekVape LOOP RDA comes highly recommended.